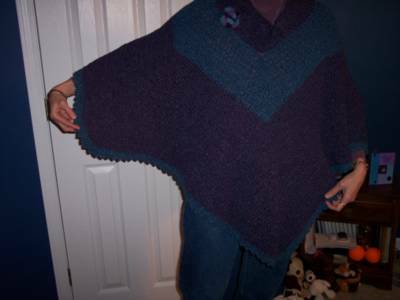 I designed my own poncho recently. I used TLC Amoré for the body of my poncho and Red Heart Super Saver for the flower, but I think this pattern should work with any yarn. I do like how the TLC Amoré drapes, though, and how soft it feels. This poncho has four points. The increases at the front and back points alternate between 3 dc and 5 dc every other row, but the increases at the shoulder points are always 3 dc. 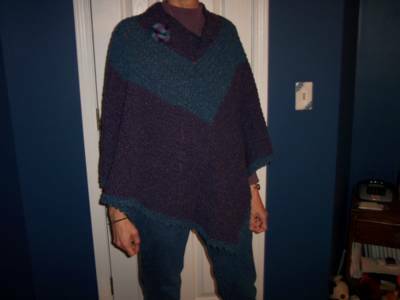 This method makes a poncho that is slightly longer in the front/back and shorter from side to side. The neckline is an open collar, and I've attached a crochet flower for added interest. The poncho I made would fit a medium through an extra large, but ponchos are really easy to alter so they fit properly. In this one, be sure the beginning chain is long enough to fit around your head and settle comfortably on your shoulders. If you need to adjust the beginning chain (smaller or larger), make sure you chain a multiple of 4, plus 2 more. My starting chain is 70 (or 68 + 2), which gives 68 stitches in each collar row. Then when you start the body portion, divide the number of stitches by 4 to determine where to put the increases. In my poncho, I used 68 ÷ 4, which is 17, so I dc in 16 stitches and increase in the 17th stitch. 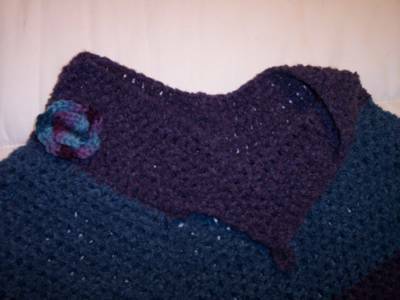 Then, because this is crocheted from the neck down, once you start the body portion, you just keep crocheting until it's as long as you want it to be. I use four stitch markers (I use small safety pins) to mark the increase stitches so that I don't have to pay too much attention to what I'm doing. Size: From bottom of collar to front point, approximately 25". From bottom of collar to side point, approximately 22". Gauge: 5 dc = 2"; 3 rows = 2"
Note: Ch 2 counts as first dc in each row or round. You can ch 3 if you prefer. Rows 3-5: Repeat row 2. Round 3: Ch 2. Dc in each st around, BUT: 3 dc in center st of the 3-dc clusters at each shoulder, and 5 dc in center st of the 3-dc clusters at front and back. Join with a sl st to the top of the ch-2. Round 4: Ch 2. Dc in each st around, BUT: 3 dc in center st of each cluster. Join with a sl st to the top of the ch-2. Repeat rounds 3 and 4 until you have 9 rounds of Lake Blue. At the end of round 9, cut Lake Blue, leaving a 6"-8" tail for weaving in, and join Plum. Repeat rounds 3 and 4 until you have 20 rounds of Plum, or until poncho is desired length. Cut Plum, leaving a 6"-8" tail for weaving in, and join Lake Blue. Work one more round in Lake Blue. Border round: *Ch 3, sc in 3rd ch from hook, skip next st, sl st in next st. Repeat from * around. Fasten off. Weave in all ends. With Plumberry, and leaving a long tail to tie flower at the end, ch 4, join to form a ring. Round 2: Ch 3, join with a sl st to 2nd sc on back of each petal. Repeat so you have 5 sets of ch 3. Join with a sl st.
Weave the two tails in enough to secure stitches, then use the remaining length to tie the flower to the front of the collar. Hey, thanks for all the kind comments and e-mail you all have sent me. I really appreciate hearing from you. Thanks for reading my blog! what size does this pattern fit? Crochet Buffet asked what size this pattern fits. I would say it would fit a medium to an extra large. I'll add a new post with more details about sizing this poncho. I'm hoping to make this for someone size 18-20. Yeah, the model (me!) is a medium/large. 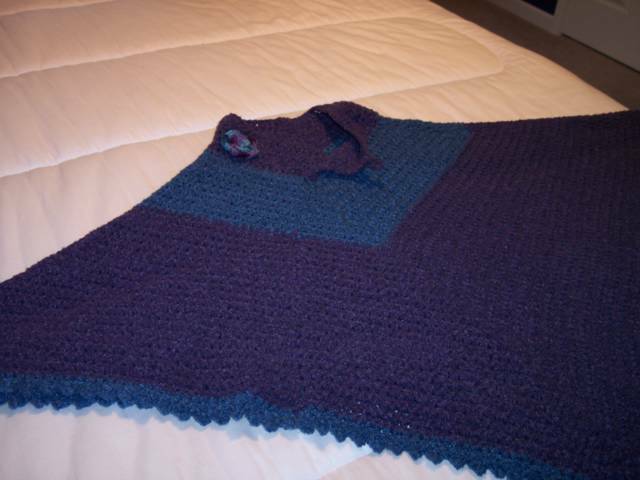 I've updated this pattern with directions for altering it. I hope this helps! If you don't see anything different, you might need to reload the page. 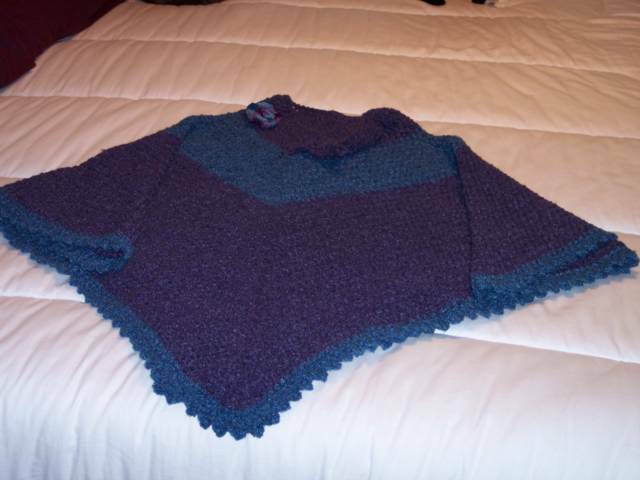 Lovely poncho, I'd love to make it after I've knitted a bit more. A lovely poncho.I loved to make phonchoes for my daughters when they were small as it was easy to make them ewar and they too did not mind wearing.I often used a pastel yarn with a whit yarn to get the thickness I wanted.It made the poncho look very pretty.I plan to make the cocoon sweater for them.I really liked the pattern and it looks very smart too. Thank you for the lovely patterns.